The Workshop Program of the Academy for Lifelong Learning is based on a “peer- learning” model that draws on the wealth of interests, experience and knowledge present within our membership. Workshop sessions normally consist of two one-hour segments, each starting with a short presentation made by a workshop participant, followed by group discussion. Preparing presentations gives participants the opportunity to explore new fields and share discoveries with colleagues. In late spring or early summer, the facilitator for your workshop will circulate a list of presentation topics, asking you to indicate your preference. You can choose a topic that you’re already familiar with or use your presentation to learn about something completely new. Talk to your facilitator if you have questions about the suggested topics or if you want to propose an alternative topic. You’ll probably want to ask the facilitator for a presentation date later in the academic year so you can observe how long-time members do presentations before you have to do yours. And don’t miss the Academy’s “Presenting Our Presenters” Forums to see our best presenters in action. Gathering the information for your presentation can be a lot of work but also great fun. Don't let the task overwhelm you. Your presentation should be a 20 to 25-minute introduction to the subject, not an in-depth dissertation. The Web with its wealth of information on virtually any topic can be a good place to start your research. You will, however, want to move on to the more reliable and complete sources found in the form of books and other materials available from the Toronto Public Library and the city’s other libraries (see the Appendix). Consult your facilitator if you have trouble locating information for your topic. Once you’ve compiled your information, you have to figure out how to organize it for the presentation. Start by deciding what basic approach you want to take to telling your “story.” If the topic is, for example, Napoleon Bonaparte, you could present chronologically (his youth, rise to power, downfall, etc. ), thematically (his impact on French administration, the conduct of war, European power politics, etc.) or by comparing him to another famous figure from history (Alexander the Great, Charlemagne, etc.). Whichever approach you decide on, try to figure out what the audience is likely to already know about the subject and what questions they will have as you start your presentation. You’ll keep your audience’s attention and maximize their learning if you answer their questions in the order that those questions occur to them. Their first question will likely be, what am I going to learn from this presentation? Starting off with a “Road Map” slide or handout that lays out the areas you intend to cover will answer that question nicely. You can also ask the facilitator to email an outline, reading or video in advance of the session to “prep” the group and stimulate their interest. Keep in mind, however, that some presenters feel that such “previews” can spoil the element of surprise they feel is critical to a successful presentation. You will find that in these days of pervasive technology Academy presentations are commonly accompanied by a slideshow. Both of the Academy’s meeting rooms at Knox College have a computer, a projector, a speaker system and Internet access for this purpose. There’s also a microphone system to meet the needs of soft spoken presenters and listeners with hearing impediments. Training on how to use the equipment is offered in early September, and there are “Tech Time” drop-ins throughout the year where you can get technical questions answered and test-drive your slideshow (always a good idea). If you use a slideshow, remember to keep the text size large enough to be read from the back of the room (24 points minimum). Slideshows consisting entirely of text slides with no visuals are to be avoided, as is treating the text on your slides as a script to be read word-for-word. And always come with a back-up plan in case Murphy’s Law (e.g., a blown projector bulb) strikes. Remember that the slideshow is just a prop. The presentation is the information in your head and notes and your ability to communicate it. Never done a slideshow? If you have PowerPoint on your computer, the Toronto Public Library offers free instruction at locations around the city (click here). If you have a Mac or iPad, Apple’s Keynote program may be the way to go. The library doesn’t offer classes on Keynote, but does have relevant instructional books and videos in its collections (click here). A third option is Google Slides, a free and simple Web-based presentation software. If you don’t want to use A/V but visuals are critical to your presentation, you can pass around photocopies of your pictures, maps and charts. So you’ve selected your topic, done your research, organized your presentation, have your slides or handouts ready and the big day has arrived. The important thing now is to relax. Remember that you’ll be speaking to people who are interested in your topic and who understand the nervousness that often accompanies a first presentation (having been through it themselves). Of course, the more thoroughly you’ve researched your topic and the more often you’ve practiced your presentation, the more at ease you’ll feel. It’s always a good idea to do a couple of trial runs of your presentation out loud with a spouse or Academy colleague (or even a mirror) as the audience. Rehearsing will also give you an idea of how much time your presentation will take. Most Academy members use notes when presenting. Try not to just read your notes, however. Look around the room and make eye contact as you speak. Remember that you’re not making a public speech but having an informal conversation with colleagues. Try to convey what excited you about the topic as you dug into it. If there’s a personal angle (e.g., an ancestor who fought at Waterloo), feel free to mention it. Simply reciting facts is the wrong way to go. Your colleagues will be more interested in where the facts led you and the issues you found for them to discuss. Do keep an eye on the time. You may have to skip parts of your presentation if you’re running longer than planned. Be sure to leave enough time for your last slides if they are the piece de resistance. You will inevitably have gathered more information in preparing your presentation than can be conveyed in 20 to 25 minutes. The extra information won’t go to waste, however. The group will look to you as a resource during the discussion phase. Most Academy presenters prefer to wait until the end of their presentation to take questions and comments. Others like to field them as they go along. In the latter case, the 25-minute time limit obviously won’t apply. State your preference when beginning your talk. In preparing your presentation, you should develop some thought-provoking questions that you can throw out in the discussion if it doesn’t take off on its own. For instance, you might ask, what was the biggest mistake that Napoleon made? Or, what was his biggest contribution to European civilization? Or even, how would the world be different today if the Battle of Waterloo had turned out differently? The discussion phase of a workshop is normally moderated by the facilitator although sometimes it works better if the presenter does it. Check with your facilitator. Lead off with a dramatic statement. Plant questions within the group. Have participants pair off to exchange ideas. Ask participants to read quotations. Dress up as that person. If you decide to use any of these, let your facilitator know in advance so she or he can support you in your efforts. Congratulations! You’ve completed your first Academy presentation, and the discussion went well. Don’t forget that the group will be looking to you for recommendations for further reading. If you didn’t have a “My Sources” slide in your slideshow, you can hand out a list of titles in hardcopy or ask the facilitator to circulate it by email afterwards. That email can also be used to tie up factual loose ends left over from the discussion. With one presentation under your belt, it’s time for you to start work on that talk for the other workshop you’re participating in, building on the experience and confidence you’ve just gained. 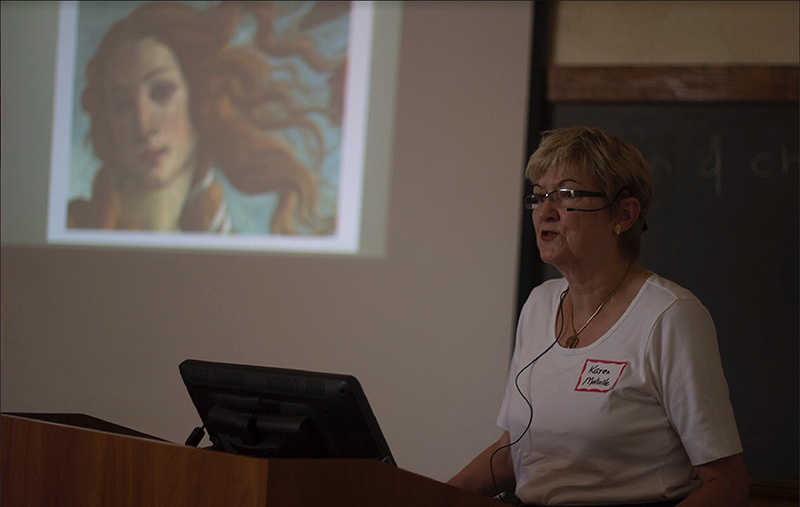 You’ll be a seasoned workshop presenter in no time, able to share your own tips with others. That’s what the Academy’s learning community is all about, members helping members! Toronto Public Library System: The catalogue is searchable online. Books, articles, films and other materials from any branch can be reserved online for delivery to your local branch. The TPL will, on request, seek from other libraries materials not owned by or missing from its own collections. Interlibrary loan requests can also be made for a circulating copy of a book or other material if TPL's copy is for use in library (reference) only. Toronto Reference Library: Located steps away from the Yonge-Bloor subway station. While most materials are for use in library only, the library offers a wide variety of materials, including books, periodicals, newspapers and electronic resources - plus videos, musical scores and pictures for loan. U of T Library System: The catalogue of the 12 million volumes held by Robarts and the system's other 43 libraries is searchable online. The general public is permitted to consult any of the materials on site. Retired faculty and librarians can access the Robarts stacks and take books out from any library in the system for free. Alumni can get the same privileges for $70-$95/year ($145 for non-alumni) or for lifetime stack access but no borrowing privileges, for a one-time payment of $25. If you live near the Scarborough or Mississauga campus, materials can be ordered for delivery there. Media Commons: The catalogue is searchable online. Holds a large collection of audio-visual materials that can be consulted by the general public on site and taken out by U of T library card-holders. York University Library System: The catalogue is searchable online. The general public can access the stacks and consult the holdings on site. Retired faculty and librarians can take books out for free. Others can secure borrowing privileges for an annual fee ($25 for alumni, $100 for others). If you don't want to make the trek to Keele and Steeles, books can be ordered for delivery at the Glendon campus at Bayview and Lawrence. Ryerson University Library System: The catalogue is searchable online. The general public can access the stacks and consult the holdings on site. Retired faculty and staff take books out for free. Others can secure privileges for an annual fee ($50 for alumni, $75 for others). TIFF Film Reference Library: Located in the TIFF Bell Lightbox at King and John Streets, the library has an extensive collection of films, books, magazine and scripts. The holdings are accessible by the general public and staffers are pleased to help visitors locate materials. The catalogue and all materials must be consulted on site, however. Approaching a library's reference desk for assistance can save you a great deal of time. The Great Courses university lectures at the Toronto Public Library and the U of T Library System can be taken out by anyone with book borrowing privileges at those libraries. Because of licensing restrictions., the electronic resources of the university libraries must generally be consulted on site. Check with the library. Google Books, an online digitized and hence word-searchable collection of the books in the world's greatest libraries, can be a handy way to locate books relating to your topic. To access it, on the Google home page, click on Apps, More and then Books. This document was prepared by Frank Nicholson based on suggestions from many Academy members and facilitators. Suggestions for improvements are welcome. Contact Frank at fnicholson@rogers.com .